Maszlee: Character building to complement 3R learning in primary schools. KLANG: Education Minister Dr Maszlee Malik wants teachers to play a pivotal role in inculcating good values in students in addition to teaching them the 3Rs (reading, writing and arithmetic). He said good values will become the fourth R in the system for character building which should begin from primary school. “In some countries, such as Finland for instance, it is a crime for teachers to even conduct exams from primary to Form Three. “This is because this period is used to build the characters of the students,” Dr Maszlee said in his speech at the opening of the maiden Educational Professionalism seminar for young teachers at a hotel here Tuesday (Aug 28) night. He said a teacher asked had him if he could be transferred back to his home state of Kedah from his current posting in Sabah where he has been teaching for two years. “I told him that he should not see his placement in Sabah there as a burden but instead an opportunity to help Sabah’s future generation benefit from education,” said Dr Maszlee. He said he told the teacher that he hoped Sabah and Sarawak will grow bigger under the new Malaysia and that he (the teacher) will be playing a role in achieving this. Dr Mazlee also promised the young teachers attending the event that he would try his best to make teaching an enjoyable and fulfilling profession as opposed to becoming a burden to them. He also added Prime Minister Tun Dr Mahathir Mohamad had asked him to convey to them of the role of teachers needed to play to build the future generation. Dr Mazlee also raised the question as to why people were not as hard working as the Japanese who strove very hard in their endeavours. He said it was also found that the attitude and mindset of people in developed nations were not found in those from developing nations. According to Dr Mazlee, it was a common thing for people to experience collective shame if something was not right in their countries such as dirty places and bad roads. He said it was this feeling of collective shame that made them forge ahead and achieve success. 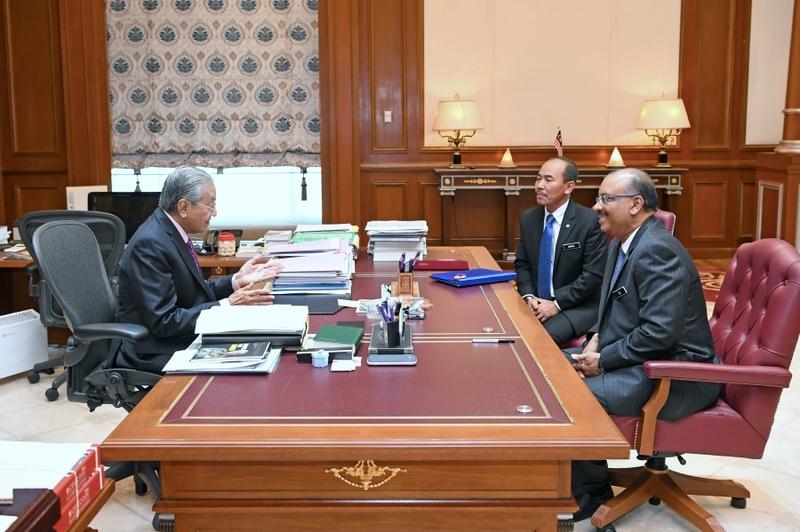 Prime Minister Tun Dr Mahathir Mohamad (left) speaks to outgoing Chief Secretary to the Government Tan Sri Dr Ali Hamsa (right) and his successor Datuk Seri Ismail Bakar at Perdana Putra. Bernama pic. PUTRAJAYA: Chief Secretary to the Government Tan Sri Dr Ali Hamsa today conveyed his last message to civil servants urging them to uphold dedication and integrity of the civil service. “Today is the last day of my service as the Chief Secretary to the Government after more than six years helming the post. “The dedication and integrity of the civil service are critical. We have always carried out our responsibilities to the best of our abilities in administrating the nation and taking care of the people’s wellbeing. “This has been proven through a series of action that had been taken towards several attempts to undermine the government’s administartion,” he said in a statement today. Ali also thanked Prime Minister Tun Dr Mahathir Mohamad, his deputy Datuk Seri Wan Azizah Wan Ismail and all Cabinet members for their cooperation in efforts to place the country’s administration to a higher level. “I want to extend my gratitude to the Council of Eminent Persons’ chairman Tun Daim Zainuddin and his fellow members for the guidance and views in ensuring the best practice of governance. “I would also like to thank the civil service for its cooperation and support in serving the nation. I hope that civil servants will continue their service based on the principle of loyalty to the King and the country, as well as discharge their duties will full dedication to the government of the day,” he said. Ali also congratulated his successor Datuk Seri Dr Ismail Bakar on his appointment as the 14th Chief Secretary to the Government. Ismail, who has been with the public service for 32 years, has vast experience in financial and economic management throughout his career. He has also held other key positions including as the Agriculture and Agro-based Ministry secretary-general, Transport Ministry secretary-general, National Budget director at the Finance Ministry and as senior adviser at the World Bank Headquarters in Washington, United States. Idrus (4th from left) together with heads of departments and local fruit and vegetable growers at the seminar yesterday. KOTA KINABALU: Fruit and vegetable growers have been urged to adopt good agriculture practices (GAP) to ensure Sabah’s fresh produce meet export quality, food safety standards which are needed to penetrate high-value markets overseas. State Minister of Agriculture and Food Industries, Junz Wong highlighted measures to improve Malaysian (MyGAP) certification includes safe use of agrochemicals among growers to increase yields, and improve confidence of domestic and foreign markets on Sabah fruit and vegetables. “The adoption of good agriculture practices needs to be given priority because the effect of our agriculture exports being halted due to problems over its safety and quality standards, and this will have a detrimental effect on Sabah’s economy,” he said. The text of his speech was read by Director of State Agriculture Department Datuk Idrus Shafie during the officiating ceremony at the closing of the seminar for Best Agriculture Practices (APB) for food producers, growers and exporters to Brunei Darussalam and Sarawak. In his address, Junz said Sabah’s fruit and vegetable sector produced 43,593.1 tonnes from total agriculture field of 21,902.2 hectares, according to State Agriculture Department statistics in 2017. He noted that the industry should heed the lessons learnt from the banning of Sabah’s fruit and vegetable exports by Brunei then followed by Sarawak due to excessive pesticide use above the minimal residual level. “The banning of our exports during the time had a serious effect on Sabah’s agriculture sector and affects farmers who also lose their source of income and this happened because fresh produce was tainted with chemicals that are harmful to consumers,” explained Junz. Furthermore, he noted Brunei and Sarawak remains important markets for Sabah agriculture products with exports to Brunei contributing RM603,408 to the state economy from an estimated 436.64 tonnes exported into the Kingdom. “This shows that fruit and vegetable sector is an important contributor to the economy, and the districts of Keningau, Tenom, Tambunan and Ranau are Sabah’s top producers of fruit and vegetables, and the largest contributors to domestic and overseas markets,” added Junz. To ensure the food safety of locally produced fruit and vegetables, Junz said the department has implemented its monitoring programme of the Maximum Residue Limit (MRL) for local fresh produce, with the cooperation of its Pesticide Control Division and the Health Department. “It is my hope that this seminar can lead to efforts to promote greater awareness among growers on safer use of pesticides and other agro-chemicals to ensure the MRL level of Sabah fruits and vegetables are within the minimum threshold,” he told over 115 growers attending the seminar. With this, he noted the certification of MyGap and MyOrganic were also introduced to increase compliance to safety and quality standards among growers and exporters needed for export markets. Meanwhile, Idrus added that Sabah agriculture has set the aim to commercialize three major fruit crops to penetrate domestic and international markets. “We will be focusing on the highly-prized ‘Musang King’ durian, including pineapple and coconut; these tropical fruit crops will be produced on an industrial scale to increase yields, and will become Sabah’s exports to domestic and overseas markets such as China among others,” he said. Kota Kinabalu: A Memorandum of Agreement (MoA) between Genting Plantations Berhad and Sabah Wildlife Department will see wildlife, including Borneo pygmy elephants, having more living space. The agreement would see 44.5 hectares of oil palm plantation land being set aside for wildlife conservation in the east coast. State Tourism, Culture and Environment Minister Christina Liew said the move would give elephants and other wildlife an undisturbed area to go to, adding that the move would also help reduce human-elephant conflict. “Today is the MOU launching where we encourage plantation owners to participate in the conservation programme for the elephants with the State Government. So its the the private sector with the government and we launch the programme to encourage more private sector plantation owners to participate as the problem of human-elephant conflicts need to be tackled soon as possible,” she said. Christina was officiating the Umbrelephant Campaign at Sutera Harbour on Monday which was aimed at creating more awareness on efforts to protect elephants in the State. Liew hoped the MoA pioneer project would encourage other plantations and estate owners to follow suit. “I do believe that after today’s programme there will be more big players who will come on. Liew said the campaign was also being introduced in schools, where it is hoped such a move can help to instil a love for animal protection in students. The campaign is ongoing and we hope at every school we can recruit young people to be in the programme. So far only five schools in the outskirts but we hope other schools including in the city will also pick it up as it is a good programme where the next generation should be able to pick up this love for conservation for our wild animals in the State. Liew said that there were only about 2,000 Borneo pygmy elephants left in Sabah. “It is not a big number. I think at 2,000 we should be setting off the alarms already. TO remain relevant and sustainable, universities must be agile and embrace change in the ever-evolving educational landscape. 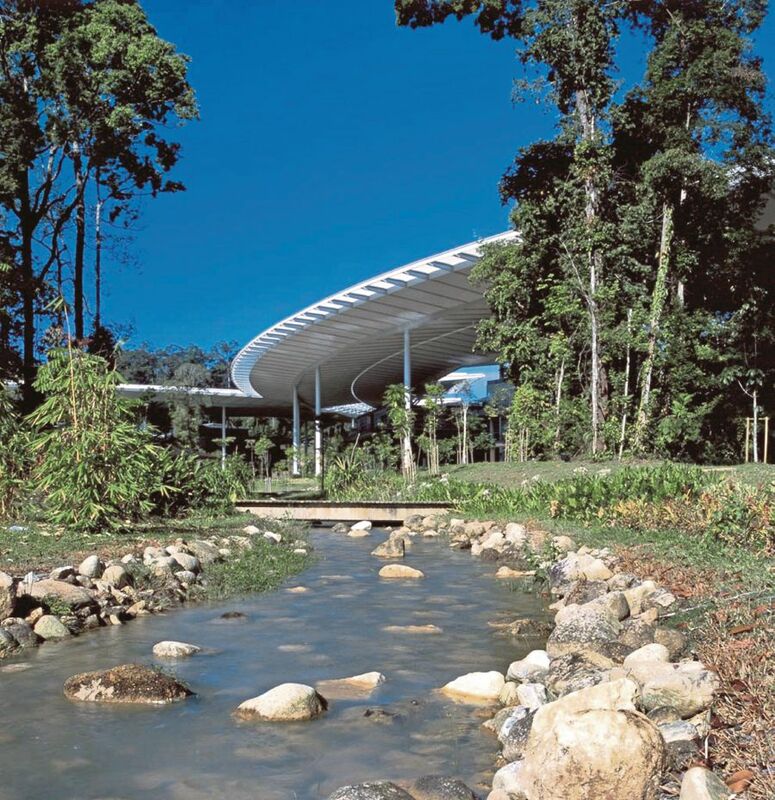 Offering guidance at Universiti Teknologi Petronas (UTP) is a special Academic Advisory Council (AAC) comprising several remarkable international personalities. And at a recent AAC meeting, a number of eminent experts offered their thoughts. Renowned UK-based futurist David Wood, for example, emphasised the importance of nurturing collaborative intelligence, agile intelligence, emotional intelligence, and a futurist mindset. Collaborative intelligence is a way of saying that when we reason two heads are better than one (and more heads are often better yet). And now human reasoning is being improved also by Artificial Intelligence (AI), and by smart online collaborative tools such as wikis. Increasingly, Wood predicts, AI will be designed to assist human reasoning even further, and to highlight false claims, faulty arguments and more. Agile intelligence, meanwhile, means quick learning from failures and rapidly incorporating changes and updates in course materials as new information becomes available. Emotional intelligence is a key element in teaching and learning. Mindfulness, among other traits, needs to be given greater prominence, Wood contends. And finally, he says, fostering the futurist mindset to anticipate trends is needed to foresee and evaluate what’s likely to be encountered on the road ahead. Students preparing to participate and contribute in this technology-driven world need a solid science foundation, of course, but also education in the humanities, arts, and social sciences — what Wood calls “socialtech”. Another AAC member, Rieko Kuroda, with whom I served on former United Nations secretary-general Ban Ki-moon’s Scientific Advisory Board, likewise notes that solutions to our complex global problems need to be multidisciplinary, integrated, and holistic. Kuroda, a former vice-president of the Paris-based International Council of Science and University of Tokyo professor, noted the steep rise in the number of “loss events” between 1980 and 2016. These include uncontrollable geophysical events (such as earthquakes, tsunamis and volcanic eruptions) that impact increasing numbers of people, as well as events the frequency and severity of which are intensified by human activities: meteorological (tropical storms, tornadoes, and other severe weather events), hydrological (flash flood, river flood, storm surge and landslide), and climatological (heatwaves, extreme cold spells, forest fires and drought). We have the means to mitigate the harm of such disasters. And global leaders have made some admirable mega commitments, such as the 2030 Development Agenda with its 17 Sustainable Development Goals and the 2015 Paris Climate Agreement. However, it remains to be seen how these lofty commitments will be translated into real actions on the ground. It has been reported elsewhere that since 2000 alone, forests equivalent in size to the landmass of Germany have been lost, 80 per cent of the world’s fish stocks have collapsed or are on the brink of collapse, and the Gobi desert is growing by roughly 10,000 square kilometres every year. Lists of such environmental concerns and pressures grow by the day, and there can be little doubt that the unsustainable use of natural resources will be the biggest challenge facing humankind in the 21st century. Abid Khan, deputy vice-chancellor and leader of the Global Engagement programme at Australia’s Monash University, meanwhile, addressing the question of how universities can shape future workforce-ready graduates, noted that broader skills are needed to build the student’s portfolio. These include generic skills (such as intercultural competence; innovative, creative and critical thinking; effective communication; resilience and adaptability; leadership and collaboration), science, technology, engineering and math skills as well as business skills. The Monash approach includes redesigning the curriculum and courses to the needs of the industries and professions of the future, with an emphasis on cross- disciplinary education and a healthy dose of co-curricular activities. Every student will have the opportunity to be exposed to industry-based experience and to develop skills that are needed by prospective employers. The last word belongs to council member Muhammad Yunus, the Bangladeshi social entrepreneur, banker, economist, and civil society leader awarded the Nobel Peace Prize for founding the Grameen Bank and pioneering the concepts of microcredit and microfinance. Yunus emphasised that for universities to stay relevant, they must connect with the world outside the Ivory Tower, assisting the global community as we strive to reach critical targets, among them zero poverty, zero unemployment, and zero carbon emissions. Dr Morni Hj Kambrie, Chairman and Founder, SIDMA College Sabah, launched SIDMA Charity Rack initiative on 27 August 2018 at SIDMA College Sabah. The Charity Rack Project, an initiative by SIDMA Staff Welfare Association (PKKKSS) is similar to the function of Food Bank, which is basically to provide last resort assistance for the very needy students; particularly food; in order for them to have a meal, and more at least for the day. Speaking during the soft launching ceremony, Dr Morni announced that the idea of having a Charity Rack at SIDMA College Sabah was initiated by Mr Zain Azrai, Chairman PKKKSS, and his committee members. During their regular meetings and interviews conducted on students to identify deserving students to be awarded the “one-off special aids fund” (also funded by PKKKSS); they found out that there are SIDMA College students who on certain days go without food due to shortage of pocket money, as well as due to other causes. He welcomed such students to visit the Charity Rack and help themselves with some of the stuff that can be consumed by them for the day. SIDMA Charity Rack initiative is basically a rack filled with daily basic necessities such as rice, salt, sugar, coffee, tea-bags, biscuits, packages of instant noodle (Maggie Mee), canned food such as sardines, and more. The rack is placed at a very strategic corner; in front of the Registrar Office, and is very accessible to the needy students. The area is also under surveillance cameras 24 hours daily, thus avoiding manipulation or misuse of the genuine effort to assist deserving and needy students. Visiting a charity rack such as this might not be a very joyful experience for students, but if you are the students who really need one of those items provided (particularly food) for the day, you are very welcomed to take it, rather than skipping meals for the day or two. However, the more number of students accessing to the charity rack could also mean that charity items in the rack will running low on supplies and could even run out before the end of the day. Hence PKKKSS is welcoming any donation of any kind. Currently, PKKKSS is funding the charity rack operation, and as Dr Morni mentioned that it will be on a trial period for three (3) months. For longer term sustainability, and in order to continue our genuine effort to assist more of our needy students, SIDMA College staff (including lecturers), students and the general public are encouraged and welcomed to contribute monthly either in cash or in kinds, to assist the continuous supply of food or other items to meet the need of our deserving students. “Learn to light a candle in the darkest moments of someone’s life. Be the light that helps others sees; it is what gives life its deepest significance”. Help others without any reason and give without the expectation of receiving anything in returns”. Roy T. Benneth, The Light in the Heart. For more information on the above project, please contact Mr Zain Azrai Bin Mohd Noor, Chairman of PKKKSS at 014 673 7035, 088-732 000; 088-732 020; or email 088-732 019. A DEAF person either cannot hear, or has never heard spoken languages – be it Bahasa Malaysia (BM) or English – used in education. But to learn, they have to master at least one first language, which should be used as a medium of instruction and learning. The mastery of this mother tongue is vital as a tool to learn a second language, which would either be BM or English, said National Education Advisory Council member Prof Dr Ruzita Mohd Amin. “A deaf person is bilingual or bicultural. Early education of deaf children must emphasise the use of a language that is considered to be their first language. The Malaysian Sign Language (BIM) serves this purpose,” Prof Ruzita, who also heads the International Islamic University Malaysia disability services unit, and was the former member of the National Council for Persons with Disabilities, said. “I’ve had complaints that teachers who do not have skills in sign language are posted at schools for the deaf. It disrupts the delivery of knowledge and the effectiveness of our education system. Teachers in special education must be properly trained,” she said, calling for more special education programmes to be offered at universities. She also suggested that a local version of the United Kingdom’s Special Educational Needs and Disability Act 2001, be enacted. Deaf students who make it to the tertiary level should join the same classes as hearing students, and sign language interpreters must be hired so that they are not sidelined. In 2012, the then Higher Education Ministry (now merged with the Education Ministry) directed all public varsities to establish a disability services unit to facilitate the teaching and learning of students with disabilities. This directive must be adhered to and extended to all private universities, she stressed. A deaf child, she said, is a gift from God. The word ‘deaf’ means inability to hear. From the community’s perspective, there is nothing wrong in the use of the word as it is an accurate description of their condition. The word only becomes politically incorrect when it is used negatively. For example, when a person does not respond, statements like ‘Are you deaf?’, is used to criticise. But the deaf are normal human beings granted with the same faculties as everybody else, she said. It’s the duty of parents, teachers, and society, to mould them into academically and professionally successful individuals. “Parents must nurture their deaf children with love just like they would any other child, and to do that effectively, parents must learn their language. “Teach them how to be independent. Give them room to grow. Don’t be over protective as it would prevent the child’s self confidence from developing. To give them access to education, the use of sign language must be promoted, and the services of sign language interpreters, provided. Sign language courses should be offered in schools, colleges, universities, and in the workplace, to promote better communication and integration of the deaf into society. Spanish firm seals its commitment to education for the young. Ovinis receiving the mock cheque from Gomez (centre) in the Bahru Stainless office located in Pasir Gudang, Johor. With them are the 10 school representatives. IN an effort to improve the command of English among students of Pasir Gudang, Bahru Stainless Sdn Bhd has contributed RM20,000 worth of Newspaper-in-Education (Star-NiE) pullouts to 10 schools in the district. Its chief executive officer Oswald Wolfe Gomez said that he hoped the initiative would cultivate a reading culture among students in both primary and secondary levels. “Newspapers provide a great sense of educational value that students can use to not only improve their linguistic skills but also gain insights and information about things around them. 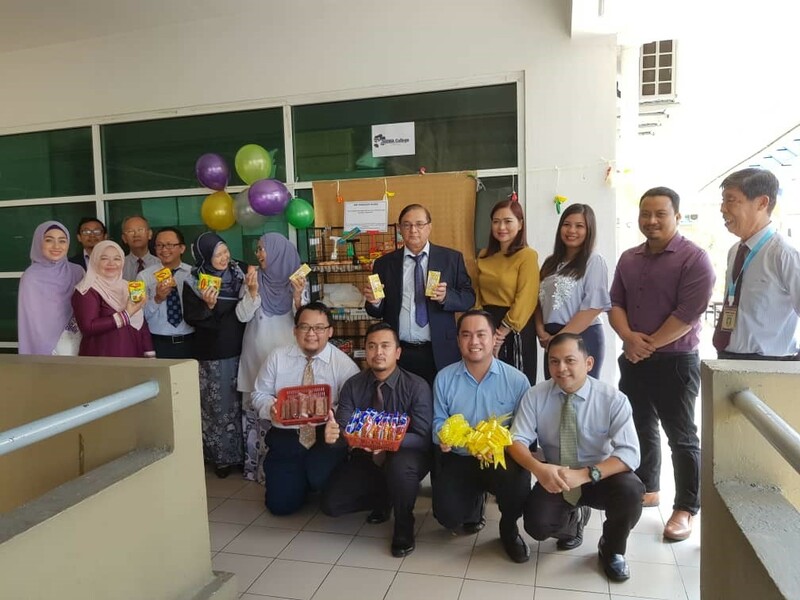 “This contribution is a great opportunity for us to improve the learning and teaching experience for schools in Pasir Gudang,” he said, adding that 90% of the company’s employees have children studying in the schools receiving the contribution. He also said that by exposing students to the newspapers at an early age, they would be able to develop critical and analytical skills. “I think it is crucial for children to be exposed to the newspapers produced by a credible source as this allows them to make their own comparison with questionable information they come across on social media,” he added. Gomez said when the idea was presented to him, he was more than happy to make the commitment. On hand to receive the mock cheque was Star Media Group NiE editorial manager Sharon Ovinis. Schools receiving the sponsorship are SK Kota Masai 1, SK Kota Masai 2, SK Kota Masai 3, SK Cahaya Baru, SK Taman Nusa Damai, SK Taman Pasir Putih, SMK Pasir Putih, SMK Kota Masai 2, SMK Pasir Gudang and SJK(C) Masai. SMK Pasir Putih principal Wardah Ismail said she was very excited to bring NiE to her students and create new teaching methods with other teachers in the school. “I would encourage teachers in the school to explore the many creative ways they can use NiE in their lesson plans and we would keep reports of those lesson plans for future reference,” she said. Meanwhile, SJK(C) Masai teacher Winson Eng Wei Siang said he believes that students would be able to learn so much more in an interactive and fun class setting. “I have experienced using NiE in a classroom during my practical years and I saw a huge difference between the conventional method of using just a textbook and using NiE. Students just sparkle when I use NiE in class. It is a refreshing and exciting learning experience for them. This method allows them to fully explore their potential and creativity. “No doubt the class would be noisy and chaotic when I conduct activities using NiE but in spite of that, I know they are learning something and that is what education should be about,” he said. He added that he would inject more fun during his English Club co-curriculum period with the NiE activities provided in the pullout. As for SK Kota Masai 3 teacher Ahmad Kanagarajah Perumal, using NiE in the classroom was something that is very close to his heart. You are currently browsing the www.Teo-Education.Com blog archives for August, 2018.